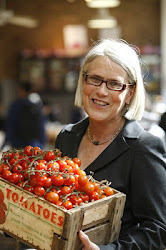 Darina Allen: A blog at last, well almost! Congratulations! I am thinking now of the things I don't do myself out of habit or fear or whatever. I think I may follow your example and jump in to change things. Congratulations and welcome to blogland :) I'm also a pen and paper girl!!! Welcome to blogland Darina. I look forward to reading your posts. I find typing on a ipad is very slow and annoying. If you really want to learn to type, can you not use a laptop? Welcome to Blog Land Darina. Technology is like Cooking - there is always a new way to do something traditional! All it takes is a little learning and a little patience and you can create anything! Looking forward to your posts. Delighted to hear you have taken the plunge. Looking forward to reading your blog. Beautiful photos of the sea urchins. Oh now, this is exciting! Welcome, and happy blogging. Looking forward to reading your blog,Darina. Well done on losing the 'technophobe' title. I always enjoy your weekly letter, so I'm very much looking forward to following your blog. Well done your new venture! Happy blogging, and of course, happy cooking! Thanks, Morgan, but I'm still painfully slow and need to have regular blogging tutorials from Lucy, my blogging mentor, who patiently repeats the same things again and again. Gdung! My poor brain!